Living outside the nation’s capital as I do, I get a steady dose of political news whether I want to hear it or not. While most Americans go about their daily lives just trying to pay their bills and raise their kids, even they can’t help but notice how badly the operation of the federal government has deteriorated. Last year politicians from both parties believed it would be better to shut down the government entirely—and blame the other side for doing so—than to compromise with each other. News organizations, which thrive on this discord, hyped the stalemate, even posting countdown clocks to encourage viewer anxiety as we drew closer to “doomsday.” In the end, and despite the incessant hand-wringing, most Americans were almost totally unaffected by the government shutdown. One group of citizens, however, took the government shutdown directly in the neck: American sportsmen, their families, and those whose business cater to them. Hunters and anglers, campers, paddlers, and hikers who had planned outings and vacations were essentially held hostage by politicians who used them as pawns. Because congress couldn’t reach an agreement, political gamesmanship ensured that federal parkland, normally open and available to sportsmen and vacationing families, sat off limits and idle. As is so often the case, the parks remained barred to their owners—the American people—for purely political reasons and to inflict the most pain possible. Along Montana’s Bighorn River, armed National Park Service personnel patrolled the “public” boat launches, shooing away professional guides who tried to take clients fishing. In case armed personnel proved an insufficient deterrent, NPS employees erected barricades to prevent guides from using the launches. At Mount Rushmore, traffic cones lined highway pulloffs to prevent motorists from stopping to take photographs of the iconic monument. Effective at 6 PM on October 1, 2013, both Everglades and Dry Tortugas National Parks will be closed. While our law enforcement rangers will remain on duty, all other administrative activities and visitor services will be discontinued until the shutdown has been lifted.If you have a trip planned for October 1st, you must conclude your business within the park by 6 PM. After today, you may not offer any services within the park’s boundaries until further notice.We regret the burden that this will place on your livelihood. This one closure effectively shut down fishing for more than 1,100 square miles. Begley’s mind is on his shop, but the small towns that surround the Park like Pigeon Forge, Sevierville, and Gatlinburg also took a hit from the slump in tourism. Angling aside, consider the millions of hikers, mountain bikers, backpackers, and families who also stayed away. In fact the towns that rely on the Smokies for revenue petitioned the Park Service, insisting that they’d privately fund the Park themselves if it would only reopen. Do I believe that our politicians set out to hurt Americans? No, I don’t. Nevertheless, that’s exactly what they often do. We frequently hear them reciting one of their favorite talking points: They want to find a way to bolster the weak economy that besets the beleaguered, middle-class American worker. And yet in Washington, they fight tooth and nail to keep national parks closed to American sporting, which generates wealth and prosperity for millions. In 2011, the American Sportfishing Association (ASA), a trade group headquartered in Alexandria, Virginia, published a report that claimed that the country’s combined economic output from fishing was $48 billion. Tack on an additional $38 billion generated by hunting—and you’re talking about some real money. But what do these figures mean? The same ASA report lists Florida as the top-rated state for income from angler expenditures. Imagine the hit to the Florida economy—and the public outcry—if the government shutdown kept Disney World shuttered for more than two weeks. And yet fishing brings in more money to the state coffers than the Magic Kingdom does. In fact fishing-related dollars spent in Florida exceed money spent in Disney World and all the other state theme parks like Epcot Center and Sea World combined. “The Outdoor Recreation Economy,” a report sponsored by the Outdoor Industry Association, concludes that a total of $646 billion are spent on outdoor recreational related products, and outdoor recreation generates six million American jobs. Conservation organizations also inject millions of donated dollars to conservation projects all over the country. Ducks Unlimited, for example, has protected or restored 13 million acres of wetlands since its inception in 1937. “But they’re only protecting wetlands to support the duck populations they hope to hunt in the future,” argue critics. To which I respond: Exactly! Hunters contribute to preserving wetlands and other habitats; the improved water quality benefits everyone. Every acre of protected marshland or wetland is essentially held in trust for us all—and for ducks, herons, bears, loons, bobcats, beavers, ospreys, moose, and diverse plant life. Heck, even alligators get a bump from better water quality. Think about it: Who will choose to send hard-earned dollars to support groups like Ducks Unlimited, Trout Unlimited, and the Tarpon and Bonefish Trust, if doing so doesn’t provide access to our country’s natural places of wonder? When the federal government is many trillions of dollars in debt, when the economy is weak and good-paying jobs are scarce, when technocrats assume that they know what’s best for us, when politicians lose any interest in compromise and see political opponents (and those who vote for them) merely as enemies to be defeated, when crony corporatism replaces the capitalism that made this country the greatest economic powerhouse the world has ever seen—then sportsmen and the small businesses that cater to them are truly on their own. The federal government isn’t coming to bail out Byron Begley or the small businesses owners in Cody, Wyoming, who are still hurting. Approximately 1 percent of the total federal budget is spent on natural resources. 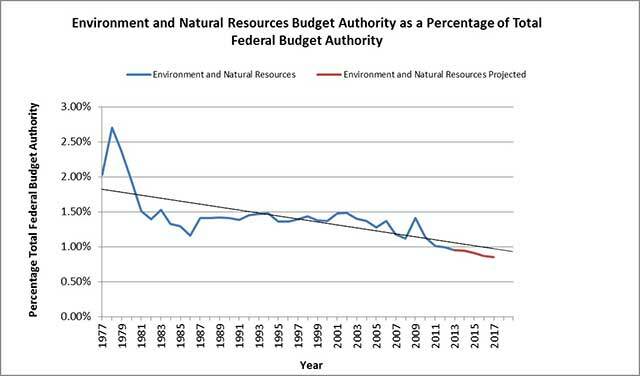 In fact, spending on natural resources now is nearly half of what it was in the late 1970s. Politicians talk tough about sound economic policy and job creation while simultaneously reducing funding for conservation efforts and denying hunters and anglers access to public land—or in other words, they attempt to balance the budget by digging for loose change in the national couch. A gloomy picture? Yes. But all is not lost. Organizations like the Theodore Roosevelt Conservation Partnership are working closely with both political parties on common cause issues and have met with some success. Recently the House of Representatives passed the Sportsmen’s Heritage and Recreational Enhancement Act (H.R. 3590) with support from both Democrats and Republicans. Introduced by Bob Latta (R-Ohio), Bennie Thompson (D-Mississippi), Tim Walz (D-Minnesota), Rob Wittman (R-Virginia), and 86 co-sponsors, the bill has broad support on both sides of the political aisle. Among other boons to sportsmen, the bill would promote hunting and fishing on federal lands managed by the Bureau of Land Management and facilitate the online sale of federal duck stamps. No bill is perfect—but H.R. 3590 goes a long way to helping sportsmen get back on the stream and in the field. We can only hope that the Senate decides to pass similar legislation. Let us hope that in the wake of the federal shutdown, our representatives in Congress have learned that any policy that undermines American sporting is all dollars and no sense.